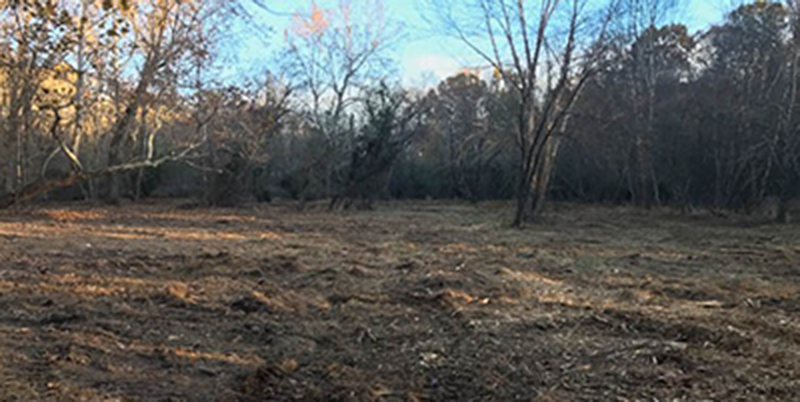 South Atlantic Landworks was founded to provide professional, licensed and insured experienced services to landowners and developers. We efficiently clear and prepare properties. Forestry mulching is fast and cost effective for clearing overgrown brush, unwanted vegetation and small trees. The one step mulching process is then ground into a top layer of mulched nutrients, without disturbing the top soil! Our safe and efficient Fecon Stump Grinder gets rid of those annoying tree stumps, and gives a clean landscape. No more wind row piles. No more burning. Landowners can count on us to deliver prompt and courteous service and the opportunity to adapt their land management plan as we implement improvements and make recommendations if required. Services : Forestry Mulching. Land Clearing. Shooting Lanes. ATV Trails. Driveways. Stump Grinding. Land Management. Fencing. Forestry mulching is a form of land clearing that makes use of one machine to do all the of cutting, grinding, as well as clearing the vegetation. The forestry mulcher or forestry mulching machine uses a rotary drum attachement with teeth or steel chipper tools that allow vegetation to be shredded. 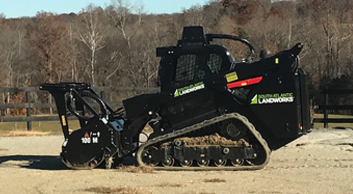 These heavey duty mulchers can clear vegetation up to fifteen acres in a day, although its work depends on the density and terrain, as well as the kind of timber and vegetation it’s working in. Mulchers can be used to prevent wildfires by making fire breaks and clearing rows around a section of timber or cut over. It can also be used to restore wildlife with new vegetation regrowth. 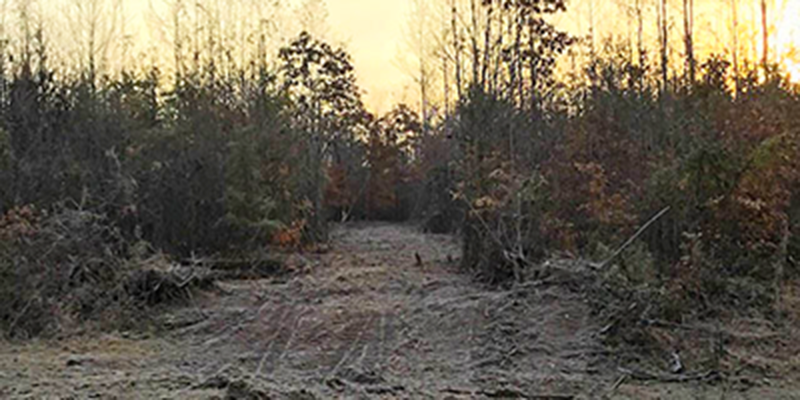 Forestry mulching is known to reduce the spread of fire by cutting fire breaks or lanes. This can reduce and cut down on the cost of any active fire. Cleanup: Once the fire is stopped, clean up starts by preventing soil erosion and providing a mulch top layer. This will prevent water pollution. Mulchers can be used to clear residential and commercial properties. Right-of-way clearing and maintenance Forestry mulching is often used in the right-of-way maintenance and clearing for roads, pipelines, highways, and other utility lines. The process often requires the complete removal of standing trees, stumps, and other vegetation. Wetlands Habitat Conservation Mulching is loved by those who want to conserve the habitats for doves, pheasants, deer, as well as other animals. The conservation of habitat for animals includes water, food, shelter aswell as new under growth which is rich in nutrients for a healthy wildlife. By mulching, the vegetation can easily be processed while removing a lot of stages like site prep, as well as the hauling and cleanup. This will remove the need for many machines excavators, bulldozers, wood grinders and so on. Mulching equipment are known to work in tight areas, as well as steep slopes, and in poor weather conditions. Mulching equipment can easily clear the land of unwanted vegetation without disturbing the soil or other parts of the desirable area. Land clearing in the past usually left the land with increased erosion by disturbing the soil, as well as removing the roots and the stumps. Mulching allows the soil structure to stay intact in most cases because the materials left by the mulcher on the soil will prevent erosion by becoming a barrier, and allow nutrients to be introduced back into the soil via the act of decomposition. Forestry mulchers are mostly designed to take down smaller trees, based on size. These mulchers with heads that move on a vertical axis can work on trees that are up to, eight inches in diameter . For those mulchers with heads that move horizontally, they are created to work on trees that have diameters of up to 30 inches. Mulching on larger vegetation may need different equipment such as a skid steer tractor attached with a larger mulching rotory drum. Mulchers are not designed to grind in rocky areas, and neither are their teeth made to grind against rock because it can dull or break the teeth of the mulcher rotory drum. Mulching reduces the amount of human labor, saves time,and is safe for the enviorment. Accomack, VA — Albemarle, VA — Alleghany, VA — Amelia, VA — Amherst, VA — Appomattox, VA — Arlington, VA — Augusta, VA — Bath, VA — Bedford, VA — Bland, VA — Botetourt, VA — Brunswick, VA — Buchanan, VA — Buckingham, VA —Burkeville, VA — Campbell, VA — Caroline, VA — Carroll, VA — Charles City, VA — Charlotte, VA — Chesterfield, VA — Clarke, VA — Craig, VA — Culpeper, VA — Cumberland, VA — Danville,VA — Dickenson, VA — Dinwiddie, VA — Essex, VA — Fairfax, VA — Farmville,VA — Fauquier, VA — Floyd, VA — Fluvanna, VA — Franklin, VA — Frederick, VA — Giles, VA — Gloucester, VA — Goochland, VA — Grayson, VA — Greene, VA — Greensville, VA — Halifax, VA — Hanover, VA — Henrico, VA — Henry, VA — Highland, VA — Isle of Wight, VA — James City, VA — King and Queen, VA — King George, VA — King William, VA — Lancaster, VA — Lee, VA — Loudoun, VA — Louisa, VA — Lunenburg, VA —Lynchburg, VA — Madison, VA — Mathews, VA — Mecklenburg, VA — Middlesex, VA — Montgomery, VA — Nelson, VA — New Kent, VA — Northampton, VA — Northumberland, VA — Nottoway, VA — Orange, VA — Page, VA — Patrick, VA — Pittsylvania, VA — Powhatan, VA — Prince Edward, VA — Prince George, VA — Prince William, VA — Pulaski, VA — Rappahannock, VA — Richmond, VA — Roanoke, VA — Rockbridge, VA — Rockingham, VA — Russell, VA — Scott, VA — Shenandoah, VA — Smyth, VA — Southampton, VA — Spotsylvania, VA — Stafford, VA — Surry, VA — Sussex, VA — Tazewell, VA — Warren, VA — Washington, VA — Westmoreland, VA — Wise, VA — Wythe, VA — York, VA.